I am very determined to get my child to tell me that she loves me. However, we've had another set back. Me: Becca, I love you. Me: Becca, do you love me? Me: Becca, do you love Mama? Me: Do you love Daddy? I guess she is just daddy's girl. Well, until I start trying to cook dinner/take a shower/use the bathroom/fill in the blank. Grrrr! One more thing I wanted to mention. Yesterday was the 7th anniversary of the day I met Lee. Everyone together now, "Awwwww." Yeah, I know. That year, it was Fat Tuesday and some mutual friends of ours were going out on the town. Being the total wuss that I am, I just joined them for a game of cards and some adult beverages, then opted out of the going out part---in my defense, I had been working late that night at a radio event. At least that boy was smart enough to keep after me. I was too tired/retarded/oblivious to think that my future husband was sitting in that room with me! This also makes me realize that we need more pictures of us. Me: Becca, can you say I love you? This is just one video of our little monkey. That's what Becca said when she saw this new quilt that came in the mail last week from Pop! It was hilarious. She plopped down on the quilt and said, "wow" about 50 times. It's hard to see, but this is a homemade quilt with all the Sesame Street characters. A lady that works with my dad made it for Becca. Isn't that sweet? I've got a new video to post, but I'm having trouble with it this morning. I'll try again later when I have more patience. 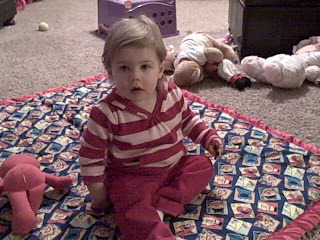 It's a video of Becca attempting somersaults--that's the new trick her daddy has taught her. Poor child, I think she has her mama's grace. Just a quick update on one of my earlier posts. If you have not checked her blog, Kelly's Korner...take a look. Baby Harper got to leave the hospital and go home yesterday! All those prayers worked. And listen to this--Baby Leighton got his heart transplant yesterday! And it came after only being on the waiting list for 5 days. What a miracle! Another bit of news is that my daddy will have his surgery on Feb. 27 in Memphis. He is going to have the DaVinci procedure done. If you are bored and want to Google it, it is a fascinating procedure. I found a great website that explained it all with a slideshow. FYI to all---we are going to have our land line phone service cut off this week, for several reasons. Mainly, because we are unhappy with the Vonage and because we use our cell phones most of the time anyway. We thought this was the best way to let everyone know. We will both still have our cell phones. Mine is 479-422-8408 and Lee's is 479-236-8785 if you don't already have them.